Page A3 of Daily Times of 21st February features the story, ‘NA committee for programmes on war on terror‘ about legislators calling for new initiatives “for changing the people’s mindset on war on terror”. The problem is larger than just creating new programmes to change people’s mindset, however. 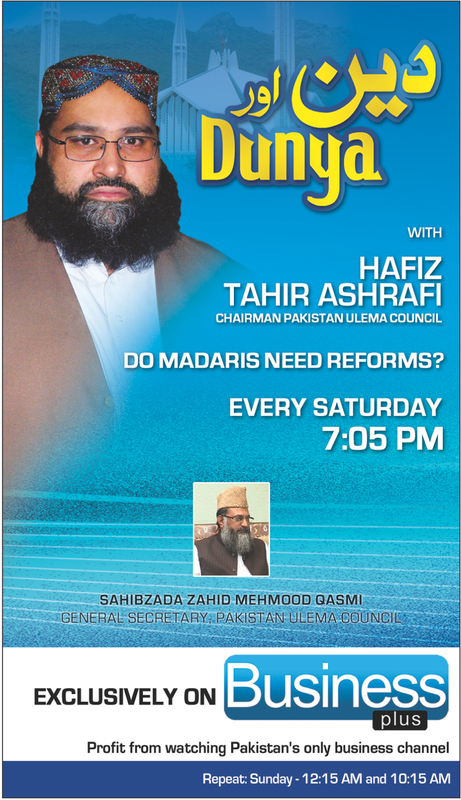 On the subject of madari reforms, what is the need for Tahir Ashrafi to host a discussion? Tahir Ashrafi has already opposed madari reforms saying they are guarantors of peace in the country, even though madaris have been ordered closed during Pakistan Day Parade due to security threats. This show will not be asking a question, but presenting a biased answer already decided. In other words it is pro-status quo propaganda only. Spreading a message of tolerance and moderation is a necessity if we are going to pull ourselves out of the ideological hole that we are in. Without addressing the fact that airwaves are already filled with messengers who are preaching support of the status quo or even worse. This entry was posted in Blogs and tagged blasphemy law, extremism, madari reform, madrassah reform, media, Pakistan Ulema Council, status quo, Tahir Ashrafi, terrorism by Sidra Jafri. Bookmark the permalink.